Omniversum - the movie theatre where you are part of the action. This movie theatre in The Hague has a screen 4500 times larger than an ordinary TV, pumps out 15,000 watts of sound from 36 speakers and immerses your senses in the most amazing film experience ever. This unique attraction is designed to transport you to another world. An all-round amazing experience! The big-screen films take you to space, where you can meet the astronauts of the International Space Station, and bring you face-to-face with the most fascinating scenery and creatures on Earth. And all without having to leave your seat. You don't just watch a film here, you become part of it! 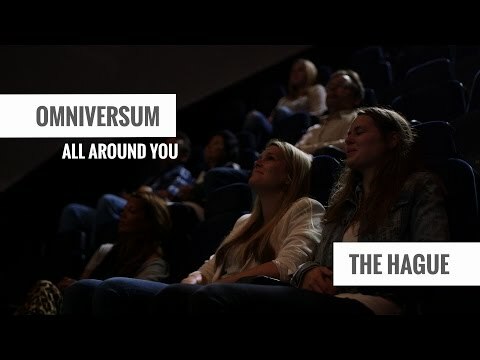 Omniversum, an attraction in The Hague for over 33 years, is a unique movie theatre, the only one of its kind in the Benelux. The films are suitable for all ages, unless specified otherwise. The films are in Dutch but a special app lets you follow the original English-language version using your own mobile phone and headset. Earphones can also be obtained from the Omniversum front desk. A new film starts every hour on the hour. If you want to watch a second film on the same day, you'll get a discount. Omniversum is suitable for children from the age of four, but some young children may find the large screen and sound system rather overwhelming.